WEEDSPORT, N.Y. (June 11, 2018) - Just 24 hours after earning his first Arctic Cat All Star Circuit of Champions presented by Mobil 1 victory of the 2018 season, Lemoore, California’s Carson Macedo dominated his way back to All Star victory lane, this time during action at the state-of-the-art Weedsport Speedway in Weedsport, N.Y., on Sunday, June 10. 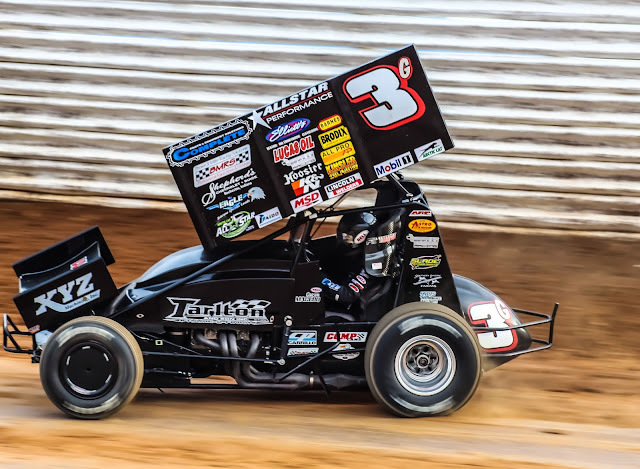 Much like his feature campaign on Saturday evening at Stateline Speedway, Macedo led all 35 circuits during main event competition at Weedsport, clinching a second consecutive $5,000 payday, as well as a third-career All Star victory. To make things more impressive, Macedo crossed under the final checkers eight seconds ahead of eventual runner-up finisher, Paul McMahan, lapping up to the 15th position in the running order. Danny Dietrich finished third just behind McMahan, followed by Aaron Reutzel and a hard charging Parker Price-Miller, who advanced 13 positions to earn the evening’s MSD Performance Hard Charger Award. The Weedsport Speedway appearance was a first-ever for the All Star Circuit of Champions. Brock Zearfoss led the field to green on Sunday night at Weedsport Speedway. Unfortunately, Zearfoss found himself facing the wrong direction after entering turn one during the initial start, also collecting Dave Blaney. With two cars involved, the feature field was criss-crossed allowing Aaron Reutzel to inherit the top spot with Carson Macedo to his outside. Macedo took advantage of his inherited starting position and jumped to an early lead right from the drop of the green. Although distracted by two additional cautions, one on lap four and another on lap 20, Macedo maintained control, actually extending his lead to just shy of two seconds by the time the feature’s second caution appeared on lap 20. Perhaps, the most challenging segment of the 35-lapper took shape with just over ten circuits remaining. Relying on the very topside of the speedway to navigate the 4/10-mile, dirt oval, Macedo was faced with traffic stacking up two and three cars wide, ultimately forcing Macedo to rely on the bottom, as well as the middle to maneuver through lapped cars. Although challenging as first, Macedo’s technique through traffic was flawless, instantly bouncing back to a four second lead with five circuits remaining, increasing to eight by lap 35. With their first New York swing of the season in the books, the Arctic Cat All Star Circuit of Champions presented by Mobil 1 will switch gears and begin preparations for a nine-day campaign in the Buckeye State. The 2018 edition of Ohio Sprint Speedweek will feature nine straight days of sprint car competition, comprised of eight different facilities throughout all four corners of Ohio. Atomic Speedway in Chillicothe will host Tony Stewart’s All Stars twice during Ohio Sprint Speedweek, with Attica Raceway Park, Eldora Speedway, Waynesfield Raceway Park, Wayne County Speedway, Sharon Speedway, Muskingum County Speedway, and Limaland Motorsports Park each hosting the Series once. More information pertaining to Ohio Sprint Speedweek will be posted during the next few days. Fans are encouraged to stay alert online and on social media.